What It’s About: Russian soldiers unwittingly unleash Zoltan, the Hound of Dracula and his minder, Veidt (Reggie Nalder). The pair travel to the United States to find the last living descendants of Dracula-the Drakes-in order to turn father Michael (Michael Pataki) into a vampire. Can Romanian Inspector Branco (Jose Ferrer) find the Drakes in time to save them? Will Zoltan turn all the Drakes, including their pet dogs and puppies, into vampires? Why Watch it Today? : Author Bram Stoker was born today in 1847. There is simply no way that he could imagine that his enormously successful epistolary novel would eventually inspire today’s film, which reworks the basic events so that a vampire dog is menacing a family and turning their pets into vampires (be sure to stick around for the final “it’s no over” scene, one of the silliest of all time)! 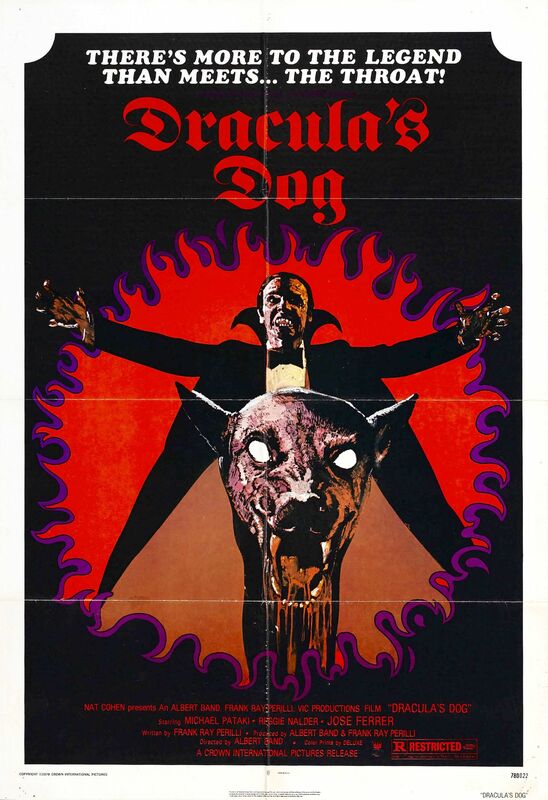 Dracula’s Dog is not good in any normal sense of the word, but is highly entertaining as a bizarre misfire that sought to combine the 70s vogue for Dobermans with the basic Dracula plot. Other Choices: If you’re looking for more ways to make Stoker roll over in his grave, you could watch unlicensed adaptation Nosferatu, which Stoker’s widow unsuccessfully attempted to destroy for all time; The Legend of the Seven Golden Vampires, in which Shaw Brothers got their kung fu action epic in Hammer’s Gothic horror chiller and the two did not go quite as well together as chocolate and peanut butter; Dracula A.D. 1972 where old men’s ideas of hippies revive Dracula in the London of “now” and only Van Helsing’s grandson (and modern plumbing) can stop him; or Blacula, in which Dracula is a racist slave trader who turns an African prince on a diplomatic mission into a bitter, lonely vampire. How about Son of Dracula, in which old Drac is upstaged by a Femme Fatale because this was 1940s Hollywood after all, or Dracula vs. Frankenstein, where Dracula is played by an accountant in some of the worst make-up in film history? Of course, if you want a terrible adaptation of Stoker’s work that’s an excellent movie, can I recommend Hammer Studio’s Horror of Dracula? This entry was posted in Animals Attack, Dracula, Horror, Independent, Movie of the Day, So-Bad-It's-Good, Vampires and tagged "Skippy the Wonder Dog", Albert Band, camping, cash-in, Dobermans, dogs, Drive-In, family, father, it's not over, Jose Ferrer, low-budget, Michael Pataki, mother, Reggie Nalder, rip-off, Romania, Soviet Union, the declining years.